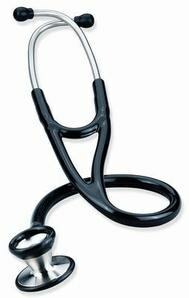 Cardiology stethoscope features a non-chill rim on both diaphragm and bell for patient comfort. Screw-on soft eartips that assures maximum comfort and excellent acoustic seal in the ear canal. An extra diaphragm with pair of small soft screw-on and firm eartips are also provided. Chestpiece - The cast stainless steel chestpiece for both 1-3/4 inch DIA. diaphragm and 1-1/4 inch DIA. deep cone-shaped bell for excellent acoustic sensitivity. Binaural - Stainless steel binaural tube with a reinforce dual inner-spring construction provides extra durability, while still maintaining portability. Tubing - Special 2 in 1 thick-walled PVC tubing for outstanding sound transmission.